This hotel was originally a prison. So the layout and interior structure in many ways is intact representing its history. However, it made me feel a bit claustrophobic, dark, and no areas that you can cozy up. They have many seating areas with side by side chair and a table in between. But none of these areas are family friendly or warm and fuzzy. The gym is very small. I had a latte in a 6 oz mug, when I asked for a larger size, they told me, “this is the largest.” I paid 7.50 for a very mediocre latte. Too pricy for its offering. Great place for people in thier 20s 30s to celebrate. The lobby turns into a super fun disco/dance club at 9pm till 1am+ and there is another bar/club on the ground floor. Rooms are beautiful but a little tired from the party crowd. South Beach meets Boston. Beautiful hotel with lots to do in the hotel itself. You can go out or stay in and enjoy the festivities. Talk about making yourself at home. When we went to grab a glass, there was a dirty one. The shaker was sticky all over. It grossed us out. The staff is super friendly. We lost our phone and when we called they were happy to return it. Beds are comfy. Bathroom is really nice. Great reuse of the property with outstanding attention to detail. not quite as nice as i expected but not a bad experience either. the "resort" fee of $20 was not expected..there are no amenities to justify the fee. Beautiful hotel with great nightlife. Perfect place for us to stay without our kids. Very friendly staff that takes pride in the beautiful hotel. WE ARRIVED AND WENT TO OUR ROOM. FIRST, OUR REFRIGERATOR WAS NOT REPLENISHED FROM THE PEOPLE BEFORE. WORST OF ALL, WE HAD A GROUP OF YOUNG BUSINESS PEOPLE IN THE ROOM NEXT TO US WHO PARTIED MOST OF THE NIGHT, WALLS WERE NOT SOUND PROOFED AND IT SOUNDED LIKE THEY WERE IN THE ROOM WITH US. VERY DISAPPOINTING, ESPECIALLY WHEN YOU HAVE AN EARLY MORNING MEDICAL APPT, AT THE HOSPITAL. The staff is friendly and professional. Check in was quick. Room was spacious and the mini bar was well stocked. Great spot, places to eat, very close to museums. Highly recommend. If you would like to try and sleep above a nightclub with music pounding at an insane volume till 2am, then this is the place for you! 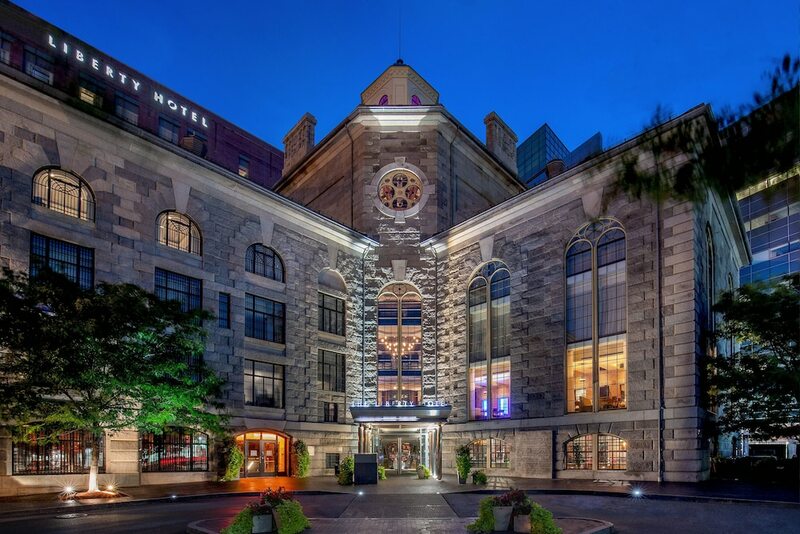 The Liberty Hotel is located downtown and is a short walk to nice shops on Charles Street. On check in we were greeted with complimentary champagne. Our room was well appointed and pretty spacious for a city hotel. We were too tired to go out after a long day, but they had a DJ in the lobby playing music. It seemed like their bars were lively spots as well. Would definitely stay here again! I really enjoyed the visit at the Liberty. The location, historic venue, food, and service were all exceptional. Located in West End, The Liberty, a Marriott Luxury Collection Hotel, Boston is within a 5-minute walk of Massachusetts General Hospital and within 15 minutes of other popular attractions like Museum of Science. This 298-room, 5-star hotel has 2 restaurants along with conveniences like a fitness center and a nightclub. This hotel is home to 2 onsite restaurants, perfect for a quick bite to eat. Savor a meal from the comfort of your room with 24-hour room service. For your convenience, breakfast is available for a fee. Guests can expect to find an LCD TV with pay movies. Beds are dressed in Egyptian cotton sheets and down comforters, and the bathroom offers a hair dryer and designer toiletries. Other standard amenities include a sofa bed, a minibar, and a coffee maker. Guests of The Liberty, a Marriott Luxury Collection Hotel, Boston have access to a nightclub, a fitness center, and free WiFi in public areas. Valet parking is available for USD 60 per night, and there's also limo/town car service. Front-desk staff can answer questions 24/7, and assist with tours or tickets, dry cleaning/laundry, and luggage storage. Other amenities at this luxury hotel include conference space, a business center, and a computer station. Thank you for sharing this review and for the complimentary remarks regarding our energetic atmosphere. We did complete a full guest room renovation in 2016, so this feedback is certainly isolated to your particular guest room and we will look into this right away, thank you for the feedback. Thank you for this amazing review, we are so happy to hear that you enjoyed your time at The Liberty! Thank you for the complimentary remarks regarding our friendly staff. We are sorry to hear that we missed the mark on this housekeeping issue which is certainly out of the ordinary; we appreciate the feedback and hope to earn a five-star review on your next stay with us. Thank you for sharing this review and we hope to earn a five-star review on your next stay with us. Thank you for the complimentary remarks regarding our unique "upside-down trees" holiday decor! Thank you for this excellent review and kind words regarding our unique history, we appreciate it! Thank you for sharing this review. The Destination Fee is disclosed prior to booking and covers a variety of amenities withing the hotel including daily coffee service in our lobby, cparkling wine welcome beverage at check-in, and daily newspapers, among other items. We apologize for any miscommunication. Thank you for the amazing review, we really appreciate it! We appreciate the kind words regarding our friendly staff, it is greatly appreciated! We look forward to your next stay with us. Recreation features at The Liberty, a Marriott Luxury Collection Hotel, Boston include a fitness center. The preferred airport is Boston, MA (BOS-Logan Intl. ).